Mark Daubenspeck has purchased the gas station, which was operated by Larry Bagley for 35 years before his death on Aug. 14. Bagley and his wife Wanda purchased the station, 4 S. Chestnut St., when it was known as Sohio from Milton Johnson on June 11, 1983. Now, Daubenspeck becomes the next owner, although he plans to operate the station much the same way that Bagley did. “It’s going to be pretty much the same as it was when it shut down,” Daubenspeck said. Daubenspeck is not a mechanic himself, but he plans to hire highly qualified employees, as well as learn some things himself to help out. He also has been learning about EPA regulations and storing underground containers. Although he does not live in Jefferson, Daubenspeck has many ties to the area. “I grew up in Jefferson. I graduated from Jefferson. I have a brother and sister who still live in Jefferson. My parents live in Jefferson,” Daubenspeck said. He also has another brother who works at Jefferson Elementary School, and a sister who works at a doctor’s office in town. BP is his first foray into owning a gas station. Previously he has owned an insurance agency and rental properties. He also worked for 25 years at Gabriel Performance Products (formerly Occidental Chemical Corporation) before retiring from there. Daubenspeck also wanted to purchase a business where he could interact with people. “This is certainly customer-service oriented,” he said. There’s two questions that Daubenspeck has been hearing from the community. One, when is he going to open? Daubenspeck said he can’t guarantee a timeline, but he hopes to open in December. His opening depends on the gas supplier. He plans to open the gas station first, with the service side and mechanics following shortly after. And the second question people ask is whether he’s going to keep the free air. “Yes, people can still get their air,” Daubenspeck said with a laugh. 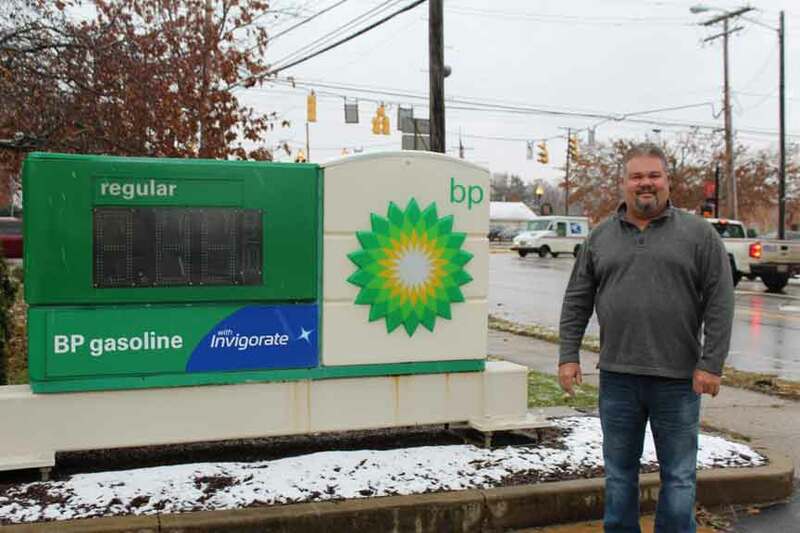 Mark Daubenspeck is the new owner of the BP service station of Jefferson.